BROMSGROVE racer Jake Clark is about to start his first full season in the British Superbike Moto3 support class. 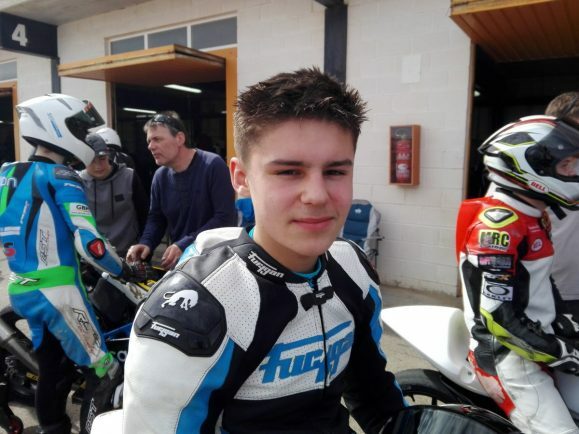 The 15-year-old has already had a taste of the standard class national Moto3 championship when he got the opportunity to join Wilson Racing from round five last season. With seven top ten finishes during the final races of 2017 Clark is enthusiastic about returning to the track. This year he has had some additional help with a kind donation from Sean McCreedy of Uroglas. They have been working for more than 30 years with low volume specialist car manufacturers plus numerous motor sports facilitating specialist glass. Whilst the racing finished last October, Clark has been working throughout the winter with Mark Lammas at Athletic Performance Training. He has also spent several days at the Ricardo Tormo circuit in Valencia and then at the Circuito de Velocidad Cartagena, Murcia as part of his pre-season preparation. The Hel Performance British Motostar Standard Class Championship is a nine round 18-race series run at some of the best circuits throughout the UK. “I’m riding again for Wilson Racing and I couldn’t have asked for a better organised team to race for,” said Clark. “We had a great time at the pre-season test where I got to meet up with my new team-mates. “We came away really happy with the progress we made at the two circuits.